"This is a huge step forward in our long-planned strategy to elevate women's surfing and we are thrilled to make this commitment as we reveal our new 2019 schedule," World Surf League CEO Sophie Goldschmidt said in a statement. 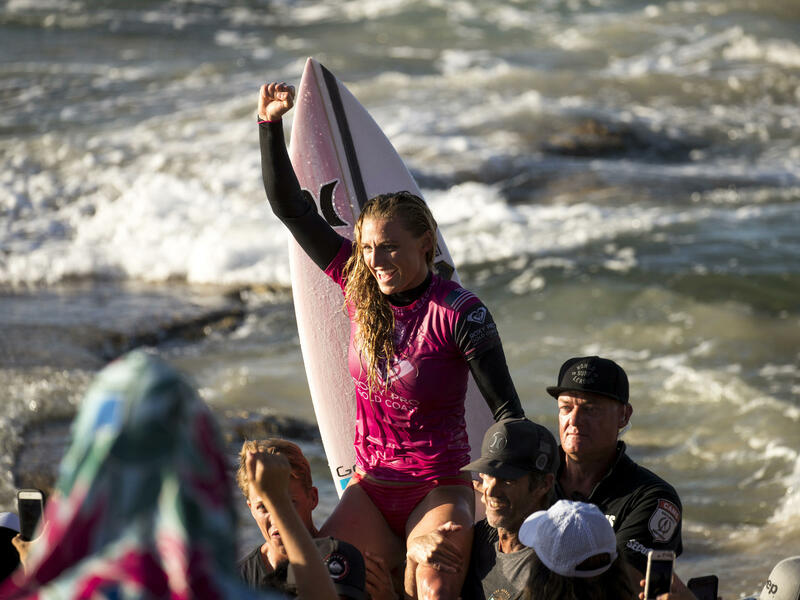 "This is the latest in a series of actions the League has undertaken to showcase our female athletes, from competing on the same quality waves as the men, to better locations, and increased investment and support." The new policy closes a significant pay gap between men and women at the league's surf competitions. At WSL events in Australia earlier this year, the men's winner was paid $100,000, while the top woman was paid $65,000. "I honestly didn't see it coming," Carissa Moore, a three-time world champion, told CNN. "It's a huge deal. It's more just the statement that it makes to be recognized on that level and to be respected as elite athletes alongside the men." "When I first started surfing, I would go out to lineups and I would be the only girl," she said. "And it still is very hard to catch waves sometimes in some lineups with all the guys. It has been difficult in the past to fight for better waves, and to get respect from the males. And so to get this support from the WSL and also all the guys on tour is really exciting." In June, the league came under fire for its gender pay discrepancies after a photo from a junior surf competition in South Africa captured the issue succinctly: The winner of the boys' division held up a giant check for 8,000 rand, while the girls' winner held one for 4,000. "Did the girls surf a different ocean that was easier we don't know about?" posited one commenter. The San Francisco Chronicle notes that California's State Lands Commission made equal pay a requirement for WSL to receive a permit to hold its annual big-wave competition at Mavericks, a famous break off Half Moon Bay. But the league said its decision wasn't directly related to the photo blowback or the Mavericks issue. "The one thing we wanted to pride ourselves on was being a leader in the space," said WSL Deputy Commissioner Jessi Miley-Dyer, who is herself a former pro surfer. "We wanted to be one of the first sports to do this for the women, and we also thought that it would be a really good stand for us. And it's important as well for sports to pay attention to what's going on in broader society. "Obviously things are changing for women in the world, which is awesome," she told NPR. "So yeah, we paid attention to what people have been saying, and we thought that it was a great time to do it." Surfing will be an Olympic event for the first at the 2020 Summer Games in Tokyo, and the league seemed to recognize it could catch an early wave: "The WSL is proud to be the first American-based global sports league to offer gender pay equality," it tweeted. Kelly Slater, an 11-time world champion on the men's WSL tour, was stoked about the move. "I believe it's a great precedent to set in sports and challenges what has been the norm," he wrote on Instagram. "My brothers and I were raised predominantly by our mom on a small weekly paycheck so it's refreshing to set an example as a sport for what should be the norm, and not the exception, in society." Female athletes in many sports have been asking why their pay doesn't match that of their male counterparts. Last year, BBC Sport found that 35 of 44 sports governing bodies that awarded prize money paid equal amounts to men and women. But in sports where there isn't parity, the difference is striking. France's men's soccer team took home a prize of $38 million when they won the 2018 World Cup, and runner-up Croatia received $28 million. When the U.S. women's team won the Women's World Cup in 2015, they were awarded $2 million. And that was up from previous tournaments: "Prior to 2007 the women's teams received no prize money at all from FIFA," CNN notes. In 2016, five members of the U.S. women's team filed a wage discrimination complaint against the U.S. Soccer Federation, noting that despite generating almost $20 million more revenue than the men's team the previous year, they were paid roughly a quarter of what the men earned. The women's team reached a new labor deal with U.S. Soccer last year, boosting their base pay by 30 percent. Tennis' four Grand Slam events pay men and women's winners equally, but that's not the case in many of the tournaments that fill the rest of the calendar. "Today, I feel proud to be a surfer," Australian surfer Stephanie Gilmore wrote on Wednesday. "Proud to be a female surfer. I feel like the momentum in our society to have this conversation is incredible — because it's not just in surfing, or in sport, that women are fighting for equality in the workplace. It's everywhere."